Pen and brush, with grey and black ink and grey washes, over fine pencil under drawing, and with grey-black ruled ink border; on laid paper; 653 x 405. 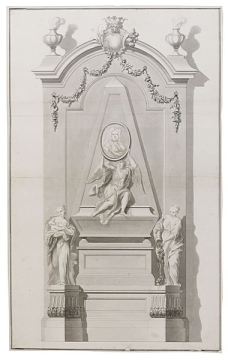 In design and technique this drawing is the companion to one at Welbeck of similar tabernacle-frame composition, in which sarcophagus on a rectangular pedestal base is backed by an obelisk panel framing an image of the Duke (Wren Society, XVII, pl. 13). Here, a winged victory holds an oval medallion portait of the Duke, while on the Welbeck design the Duke's bust is set on a circular pedestal on top of the sarcophagus. Both drawings have identical double-ruled borders with a scale bar marked across the lower border. The two standing votive figures are set on angled pedestals carved with gadrooned and acanthus ornament and the monument is crowned by a segmental cornice with an armorial crest in the centre, from which hang festoons. The figure on the left is Charity and on the right Abundance. The figure of fame on the sarcophagus is shown rising up from a seate position to display a medallion of the Duke, thus symbolising posthumous fame. The cartouche in the pediment has a strapwork border and displays alternative fronds of palm on the left and oak (?) on the right. In the executed design, 2, the Duke's effigy is more prominent, and the architectural frame is far grander. Wren Society, XII (1935), pl. 33; T. Friedman, James Gibbs, 1984, pp. 87-88, 314, pl. 76.